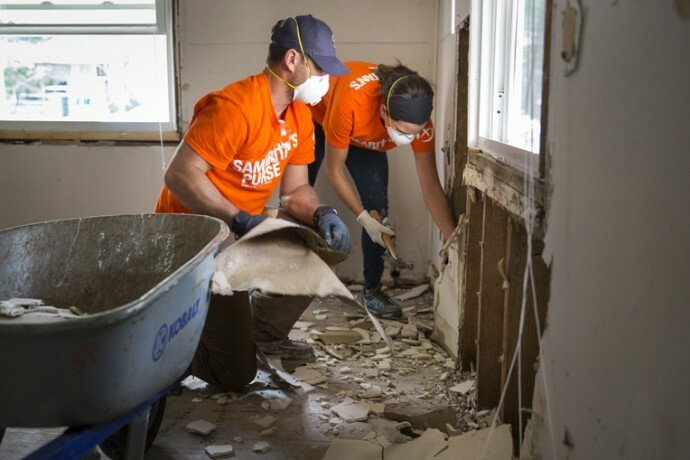 "We Can All Help People Here at Home"
Corey and Cissie Graham Lynch worked alongside other Samaritan's Purse volunteers to assist South Carolina homeowners devastated by recent flooding. Cissie Graham Lynch, daughter of Franklin and Jane Graham, had long hoped to serve one day with her husband, Corey, as a Samaritan’s Purse U.S. Disaster Relief volunteer. Unfortunately, the hectic schedule surrounding his previous NFL career prevented them from being able to deploy on that kind of assignment. Until Tuesday. Since Corey is not playing this season, their desire finally became reality as they cut short a family vacation in North Carolina to travel to Columbia. 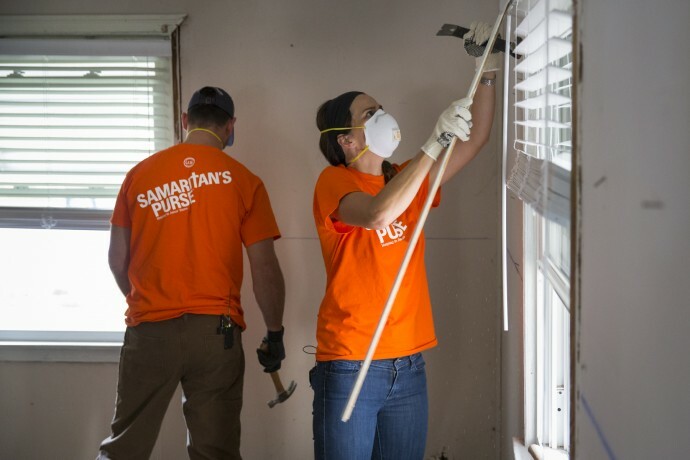 There they had the opportunity to serve alongside other Samaritan’s Purse volunteers in helping a local family clean up after historic floods devastated the city. Corey and Cissie Graham Lynch came to work hard to help homeowners in South Carolina. Cissie and Corey first visited Shandon Baptist Church, which is graciously making its property available as a base of operations for Samaritan’s Purse and for the Billy Graham Rapid Response Team. Then they drove to Downing Street, where they met up with Frank Guerra and his stepson Bobby Greene. Two Sundays ago, Bobby received a frantic phone call from his mother and stepfather that water was coming into their home. He raced over and in the nick of time pulled them from their home. Together they struggled against the current of chest-high water until they finally reached higher ground. Water completely flooded their ranch-style home. Once the water receded, Frank and his wife returned home, only to face the daunting task of gutting everything in order for a contractor to come back in and rebuild. Cissie and Corey came to work. They donned orange Samaritan’s Purse shirts and used special N-95 masks to protect them from mold and dust particles. They joined other volunteers to rip out water-logged walls and carry out the rubble to the street. During lunch, they met volunteers from Georgia, Alabama, Texas and New York, some of whom drove late into the night to get there. They talked about their families, about football, about trucks, and some of the volunteers especially had fun needling Cissie about the proper way to pronounce Appalachian. Cissie and Corey took time to walk down the street, hearing the heart-wrenching stories of the people who are dealing with this crisis. And they learned how Billy Graham chaplains and Samaritan’s Purse workers have the privilege of sharing the Gospel of Jesus Christ with homeowners. “Samaritan’s Purse works all around the world, caring for those dealing with natural disasters, genocide, churches being burned and Christians being martyred,” Cissie explained. “But we’re also responding to disasters here in the United States, and in this case, right here in our backyard in Columbia. “Not everyone is called to go to an international site, but we can all take the opportunity to help people here at home,” she said. As their time in Columbia was coming to a close, Cissie and Corey had the privilege of joining other volunteers to present a Bible to a homeowner down the street. 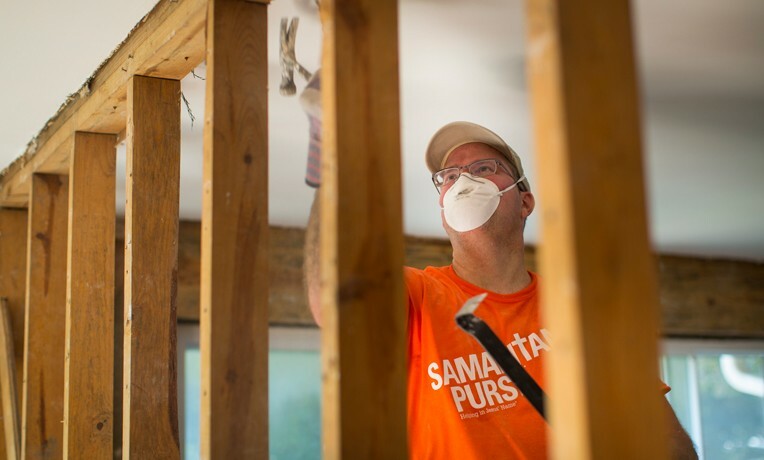 The Bible was signed by all the Samaritan’s Purse volunteers who worked on the home. 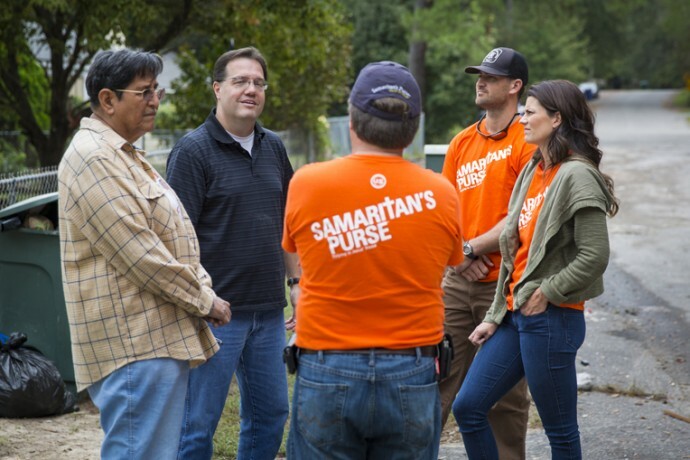 Corey and Cissie (at right), along with Samaritan’s Purse staff member Ricky Critcher, speak with Frank and Bobby (at left). Then Cissie and Corey were able to say good-bye to Frank and Bobby—and to encourage them that God loves them and hasn’t abandoned them. Frank and Bobby thanked them for their words of kindness. “Thank you for allowing us to come into your home today and to serve,” Cissie told them. Clint Rider, who coordinated the volunteer work for Samaritan’s Purse on Downing Street, said he appreciated how Cissie and Corey came to volunteer with the team.